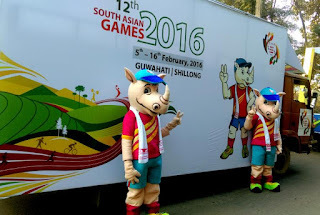 12th South Asian Games are to be held in Guwahati & Shillong from 5th Feb, 2016 to 16-Feb-2016 and will be the biggest sporting extravaganza ever held in the North East India and the 1st ever gender equal South Asian Games with men & women participation in all the sports. The Prime Minister Shri Narendra Modi will inaugurate the Games on 5th February 2016 at Guwahati in a glittering ceremony. For conduct of the games an organizing committee has been set up under the Chairmanship of Shri Sarbananda Sonowal, Hon’ble Minister of State for Youth Affairs & Sports (I/C) Government of India and Shri N. Ramachandran President Indian Olympic Association as co - chairman. The participation of athletes and officials from various countries is given below. Around 100 representatives of International Media are expected to cover the event on the spot. The Union Secretary of Sports, Shri Rajiv Yadav has said, games logo symbolizes peace, progress & prosperity in the region. It consists of 8 petals representing the 8 countries participating in the Games. Colors of petals are from the flags of the 8 countries. Mascot “TIKHOR” a Baby rhino is Sharp, Naughty, Sporty & Modern. He is a Motivator, friend and messenger of peace, progress & prosperity. The theme song is ‘Ei Prithibi Ekhon Krirangon, Krira Hol Shantir Prangon’ sung by the world famous musician late Dr. Bhupen Hazarika. It means that the whole world is a playground and sports is a symbol of peace. The song is being translated in official languages of all SAARC nations and will be sung in each of these languages. Games Secretariat has 16 Functional Areas. Arrangements are being made for ease of accreditation, arrival, departure, comfortable stay, security, medical facilities and transport arrangements, etc. A glittering opening ceremony has been planned for 5th February 2016 in Guwahati and a separate ceremony will also be held in Shillong on 6th February 2016 for athletes participating in Shillong.